It’s 10:40, and, naturally, we are at Panera. I am a creature of habit. That is no surprise to anyone who knows me well. That personal quirk coupled with Kate’s Alzheimer’s has made for an interesting few years. The good news for both of us is that I am also flexible when I have to be, and I have had to be. In fact, I look at much of the adapting that we have done in a humorous way. As someone with a few compulsive tendencies married to someone who is pretty much a polar opposite, I would say we have made it work quite well for what will be 55 years at the end of May. I consider that an excellent training as Kate’s caregiver. After a period during which she has slept later than usual, she seems to be working back to what I hope is a normal pattern. She has been getting up around 9:00 and is ready for Panera around 10:00 or shortly thereafter. That gives me three and a half or four hours to get up, eat breakfast, take a walk, check email, take care of any household responsibilities, check Twitter, and work on this blog. Kate used to get up earlier, go to the kitchen for juice and yogurt, and return to bed. For some reason, she gave that up recently. Now she sleeps later. When she gets up, she takes her shower and gets dressed. This goes on while I am in the kitchen which serves as my office. When she is ready, she walks into the kitchen. That is often when I first know that she is up. The funny thing is that when I say “she is ready,” I mean right now. The problem is that I am not. I am still dressed in my walking clothes and need to change for the day. It annoys her that I am not ready to leave that minute. There’s always a way to deal with a new issue like this. Now I periodically go back to our bedroom to check on her. At some point, I discover that she is no longer in bed. When that happens, I change clothes, get her medications and put them on the island in the kitchen with a glass of water, get her iPad and her cup along with my own cup to take with us to Panera. Then when she walks into the kitchen, all I have to do is close my computer and put it and her iPad in my computer bag. I can easily do that in less time than it takes for her to take her pills. On those mornings when I am late in discovering that she is up, I have to rush getting dressed and gathering our things together. While I am doing that, she usually goes to the car and waits for me. Even on cold mornings, she usually forgets to wear a sweater or coat. Fortunately, she has never had to wait long. I pick up a coat for her along with the other items mentioned above, and we’re off. When we arrived at Panera this morning, I noticed a group of women were seated next to the table at which we usually sit. They come to Panera about once a week after their morning run. They are usually pretty loud. When they arrive before us, I try to find a table in a different location as I did today. I stayed near the table while Kate got a drink. I stood so that I could see her, and she would be able to see me. I knew she would not remember where I was. After getting her drink, she walked directly to our regular table. I walked over to get her. She was waiting calmly for me, and I noticed that she had taken my cup instead of hers. Her ability to distinguish things that are different has diminished as well. My cup is smaller and made of stainless steel. Her cup is a larger green plastic cup. They are just the same to her. Similarly, she often picks up my iPad thinking it is her own even though mine is a larger version with a keyboard. Naturally, I am going to be a little sensitive about this since she is usually eating a muffin. Inevitably, that means crumbs and oil on the keyboard and screen. I try not to let on that this bothers me, but sometimes I fail. Kate always enjoys being around children. We sat by a couple with a toddler at the table beside us. She initiated a brief conversation with them just before they left. On the other side of our table sat a mother and her two girls, one who is 4 and the other 2. Just watching children brightens Kate’s day. I think it’s going to be another good day for us. We’re on a different schedule today. Kate slept unusually late this morning. I decided that given the flu, rest would be a good thing. I checked on her just after 11:30. She was still sleeping soundly. That gave me plenty of time to have my breakfast, wash, dry, and fold two loads of clothes, as well as checking the morning email and spending time on my blog. In addition to rest, I know that she is supposed to get her Tamiflu approximately every 12 hours. That led me to wake her at noon. When I got to the bedroom, I saw that she was already up. I went back to the kitchen which serves as my office. I continued to work on another blog entry on social isolation that I will probably post on Monday while waiting for Kate to get ready. Kate finally walked into the kitchen about 1:15 not knowing at all what time it was but ready to go. She was a little grumpy. In a cheerful tone of voice, I told her I was so glad to see her, and I wasn’t going to do anything to upset her day. She smiled. I gave her a hug, and she was fine. I had already decided to skip Panera and go straight to lunch at Bluefish. It was 2:00 when we sat down at a table. By this time I was already getting an impression that we were both making steady progress recovering from the flu. Except for having slept so long as well as several times she coughed, Kate seems back to normal. I also feel better but know that I still need another day or to before I am where she is now. We left the restaurant at 3:05. I knew that Kate would not want to spend the rest of the afternoon at home; so I had brought our iPads and cups planning to go directly to Barnes & Noble. That is where we are now. Before settling down at my iPad, I had one of those experiences that every parent knows about but might not think of in connection with a person with dementia and her caregiver. I selected a table for the two of us and gave Kate her iPad while I got her a passion fruit tea with lemonade. I returned to the table with her cup. Then I took out my iPad. Before I could start, she asked me where the bathroom was. It is located off the main area; so I don’t feel comfortable letting her go or return on her own. I closed my iPad and carried hers and mine as I led her to the restroom. I waited right outside and brought her back when she had finished. This kind of shift from one thing to another is not a big deal, but it happens so often that it can be a problem for the caregiver. I should note that sometimes I can predict such things. In fact, this was one of those times. I had thought of asking her about going to the restroom at the restaurant. Then I thought I would wait until we arrived at Barnes & Noble. That plan failed when I forgot to do it. It’s another illustration that as a caregiver, I am frequently making these kinds of mistakes. There is just so much to remember. For someone like me having a schedule is helpful in getting things done. Since our return from Texas, Kate has been getting up later. That has meant getting to Panera has been later. That hasn’t presented a problem since I haven’t had any meetings or other obligations during the holidays. Today is different. I go back to Rotary. That means the sitter comes at noon instead of 1:00. Today is different in another way. Kate got up earlier, probably related to the fact that she went to bed shortly after 7:00 last night. That influenced our morning schedule. We got to Panera earlier, and she wanted to come home before lunch. I generally try to get her to lunch at 11:00 so that we can be back for the sitter in plenty of time. When I went to our bedroom at 11:00, she was resting in bed. I asked if she would like a sandwich. She said she would rather stay in bed. I decided to let her remain in bed and that the sitter could take her to lunch. A little after 11:15, she came into the kitchen with her coat on and iPad under her arm. She was ready to go back to Panera. Knowing that we might have difficulty getting back home in time for the sitter, I called the agency and asked the sitter to meet us at Panera, something I may establish as a regular routine. That would be a better way of handling the situation rather than rushing Kate. Before leaving the house, she took a can of Dr. Pepper out of the refrigerator to take with her. She is particular about the mixture of Dr. Pepper she often gets out of the machine at Panera. When we got out of the car, I took the can of Dr. Pepper. When we got inside, I offered to get some ice. When I came back to the table, I pulled the can of Dr. Pepper out of my pocket and poured it into her cup. She said, “Aren’t you smart.” When I asked why, she indicated it was because I brought the Dr. Pepper for her. She had forgotten that it was she who had actually thought to bring it. Then I left to go to the counter where I ordered her sandwich. As I returned to the table, I noticed Kate at the drink machine. She had emptied the Dr. Pepper, replaced the ice, and was getting another drink from the machine. When I asked about her Dr. Pepper, she had no recollection of having had one. I don’t know why she poured it out. I just let it go. She took a sip out of her drink. She didn’t like it and gave it to me to taste. She had gotten carbonated water. I went back to the machine and got her an Arnold Palmer. She is now happily working on her iPad while eating her lunch. She seems happy. So am I. The major learning in this episode for me is that I should be prepared to let the sitter meet us here every week unless there are other reasons for doing otherwise. I can’t be too rigid with my own desire to stick to a regular schedule. By letting go, I will save myself a little stress. Last night I told Kate that our Y breakfast was today. She likes to attend, but she also likes to sleep in the morning. The past 2-3 months we have not made it because she didn’t want to get up. Thus, last night I asked her if she really wanted me to get her up. She said she did. After Kate and I got home from lunch today, I came inside. She wanted to pull leaves in the backyard. I had a 2:00 doctor’s appointment and had decided to take her with me rather than leaving here home alone. When I told her I was taking her, she didn’t question it at all. The same was true the last time I paid a visit to his office. My plan was to leave the house at 1:25 in order to be there 15 minutes before hand. At 1:10, I went outside and told her it was time to get ready to leave. She said she wanted to change tops. I told her that would be fine, but we didn’t have time for her to take a shower. She didn’t like that, but I thought she had agreed. I gave her a few minutes to change. Then I went back to her room where it appeared that she was getting ready to put on clean clothes. I told her I was just checking, that we needed to leave. I left her again. When I went back, she had just gotten out of the shower. I told her it was time to go and to hurry. I hate doing this, but she moves as though time doesn’t matter at all. Then I said, “I really need to go.” That led to a panic attack that didn’t fully cease until after we were in the doctor’s waiting room. What really bothers me more than that I caused the attack is that she is then so sorry that she has upset me. We are now back home. She was fine even before we left the doctor’s. 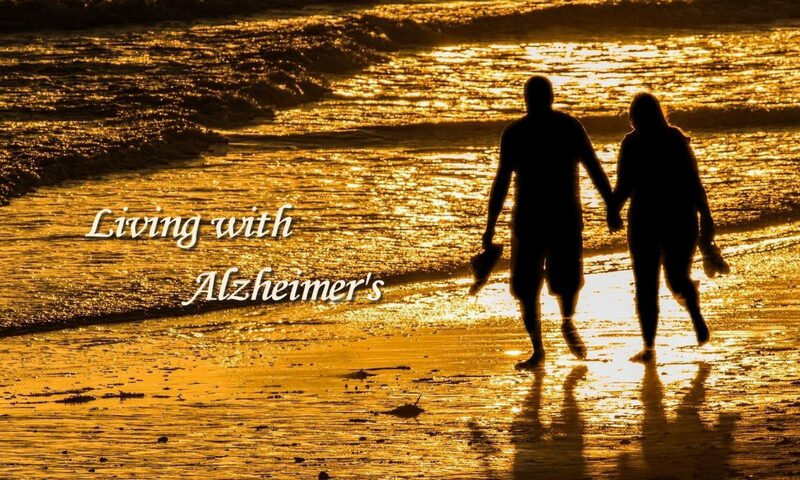 That is one of the positive things about Alzheimer’s. Shortly after we got home, she wanted to go outside to pull leaves. She asked me if she could do so. I told her she could. She asked if she could pull leaves in front. I told her she could. She came inside and put a shirt on over the top she was wearing. I was here in the kitchen. She walked in and asked if she could go outside. Again, I said she could. She asked if she could use the clippers. When I told her yes, she gave me a look of surprise as though I sometimes say no. I don’t ever recall doing so. I have often mentioned some of the coordination problems that arise because Kate doesn’t remember what I have said. Right now we are experiencing one of those occasions. At 6:05, I went outside to tell her the time and that we should be getting ready for dinner, something we typically do between 5:45 and 6:30. She reacted negatively and said she wanted to plant a few other plants we had bought at Lowe’s yesterday. I said OK, but I really felt like it would be best to start getting ready now because she will need to take a shower and then dress. That sometimes takes an hour. I know, however, that she might need only 30-45 minutes. As I get to this sentence, I see that it is 7:11, and she is still outside. This is one of those occasions that almost any married couple could face almost daily. In a normal situation, however, they could talk about it and negotiate something that would suit each one. I recognize, of course, that it can also end up in a standoff. My view is that such a standoff in our situation is simply unproductive. For example, if we had an appointment to be someplace at a particular time, I would need to push her a little. In tonight’s situation, we don’t have any such obligation. This is the more typical case for us; so I am simply letting her stay as long as it takes (that is, unless it gets close to 8:00). While I take this position, I have to be honest in saying that I am really ready to eat and would like her to see that and do it for me. On the other hand, I know that her brain doesn’t work normally. She would never have been like this before Alzheimer’s. I truly miss being able to have normal conversations about things like this, but those days are gone. Something similar happens with the temperature in the house or in the car. Most of the time I am comfortable, and she is hot. That means that she wants me to make the house or car cooler. I always comply with her desire, but I do sometimes let her know that I am either comfortable or in some cases cold. She totally disregards this and actually thinks I am crazy. I, naturally, believe that her own body thermostat is not working the way it used to do. I do recognize that she feels hot and try to see that she gets relief, but I would love it if she gave just a little recognition to the fact that I am cold. Alas, there is no way to reason with someone who has Alzheimer’s. We are now at Panera, something I had planned for the morning though it didn’t happen quite the way I intended. That is one of the commonplace occurrences in our lives nowadays. Each day I list the day of the week, the date, and our activities for the day. Except for meeting and other appointment times, I am flexible though I put down a specific time. This morning I put down 10:00 for Panera. Most days Kate isn’t ready before that time. Once in a while, she is. Today was one of those days. It is also an example of how short-term memory affects coordination. Shortly after 8:00, I mentioned that we might go to Panera this morning and have an early lunch before a United Way communications meeting I have at noon. Here is how things turned out. At 9:15, Kate walked into the kitchen and said, “Well, I think I will work outside for a while.” She sounded as though it was not something she was excited about, just something to pass time. I said, “I thought we were going to Panera.” She smiled and said, “Oh, I forgot.” Then she turned around to go back to her room to change. She looked happy that we were coming here. At that point, I was still in my walking clothes and needed to change for the day since we would not be coming back home in time for me to get ready for my meeting at noon. It turned out she got ready very quickly but she had only changed clothes. She had not gotten her iPad that she uses while at Panera or her cup that she also uses for her drink. I also noticed that she didn’t have a sweater, and it is usually a little cool at Panera in the morning. So I gathered all my things as well as these things for her, and we left at 9:35. All of this occurred without any angst on her part or mine. I have learned to consider these kinds of things normal. She is always ready to do something that she likes. Most of the time Panera fits the bill, especially if it is in the morning. First of all, I think she considers the blueberry muffin to be a treat. Second, it is a comfortable location to pass time. We almost always see people we know. My intention in writing down this experience is to convey that this is the kind of thing that happens multiple times during a day. They are not horror stories in any way, but they are examples of how the caregiver is always shifting gears and trying to head off or solve a problem. There are so many of them that I find myself slipping. A good example is a phone call I placed this morning. About a month ago, I took Kate to see a neurologist who said he would need her to get an MRI. We did that a few days after the appointment. I expected to hear from the Doctor the next week that he had the results and wanted to schedule an appointment. I have thought of this a number of times since then but never remembered to call the doctor. It turns out that the doctor has never received the results. His office is going to call today. Then we will schedule a follow up appointment with him. This is the kind of thing that I could and should have taken care of right away, but it somehow just didn’t rise to the top of my list of things to do. That is happening with many of my obligations.